... 1975 (35 years ago today), naval gunboats of Khmer Rouge-controlled Cambodia seized the American freighter Mayaguez and its 39 crew members. U.S. President Gerald R. Ford (left) called the capture "an 'act of piracy' and promised swift action to rescue the captured Americans." 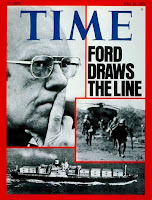 Two days later, he sent Marines to the island where the crew was being held and ordered the port bombed; Cambodia "was already in the process of releasing the crew of the Mayaguez and the ship," and 41 "Americans died, most of them in an accidental explosion during the attack." 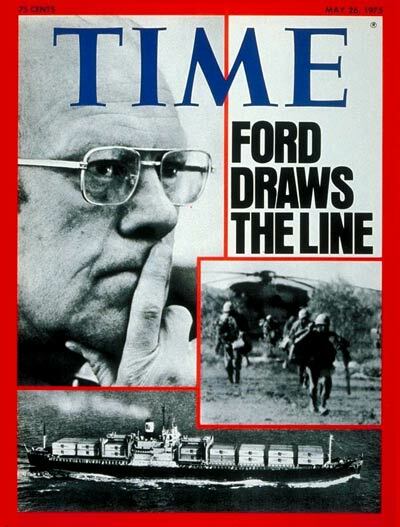 A later congressional inquiry criticized the administration for failing to exhaust diplomatic channels before using force; nevertheless, as indicated by the Time cover above, the rescue effort won popular support in the United States.